The tiny island of Sangalaki was opened for diving in 1993, it is famous for large groups of mantas that come here to feed on the plankton. Sangalaki's shallow reef system extends over 200 meters from the island, apart from some steep coral ridges in places, generally falls away gradually and most diving is undertaken in water up to a depth of 25 meters. Sangalaki and it's surrounding reefs are protected as an Indonesian Marine Park. Without the destructive effects of explosives and cyanide fishing, Sangalaki has remained a pristine example of an untouched tropical marine ecosystem. 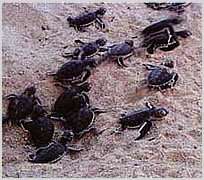 The island itself is a breeding ground for green turtles. At night female turtles come ashore and lay their eggs and small baby turtles can be seen regularly as they hatch and desparately struggle their way to the sea whilst dodging hungry birds. Sangalaki can be reached via Balikpapan, Indonesia or via Tawau, Sabah by an hour flight to Berau and two hour boat ride down the scenic Berau River. To the east of the island are Manta Avenue, Manta Parade and Manta Run - where the manta rays can be found feeding, gills wide open, on a rich supply of plankton minutes from the beach. The mantas can sometimes be seen cruising down these manta highways, whilst other rays forage around for food under the sand together with the goatfish. Their wing tips break the surface at regular intervals as they circle around you. They prefer to swim close to the surface, so snorkeling or free diving is also a good way to interact with them. 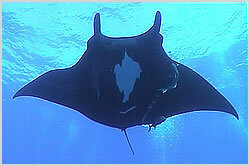 The best time to see them seems to be full moon when there might be as much 20 mantas hovering over the cleaning stations. Manta Avenue starts just east of the The Lighthouse where the coral steps its way down to the first sandy tracks which is an ideal environment for the beautifully coloured Fire Goby, Elegant Fire Goby and Dancing Goby together with the Jaw Fish and Ribbon Eels. There are also two small wooden boat wrecks here. Across the marine highways at Manta Avenue and Manta Parade, the coral reef forms into an intriguing set of ridges, appearing to rise and fall like hilltops. These isolated reefs form mini ecosystems abounding with life in all its complexity. As Manta Parade joins into Manta Run, the underwater terrain flattens out to reveal numerous coral outcrops and bommies of various shapes and sizes. Each is adorned with colourful soft corals and sponges, usually topped with an elaborate display of Feather Stars and Gorgonians. With their overhangs and crevices, these underwater tenement blocks provide the ideal environment for Leaf Fish and Frogfish, which prey on unsuspecting Cardinal Fish. Sandy Ridge lies at the end of Manta Run and is home to the Garden Eels, Cuttlefish and some gloriously coloured Gobies and Nudibranchs. To the west of the island are the dive sites at Coral Gardens and Turtle Town. Here turtles can be seen frolicking around and cavorting with one another. The turtle mating season is generally all year round. Getting there : Boat 2 hours.